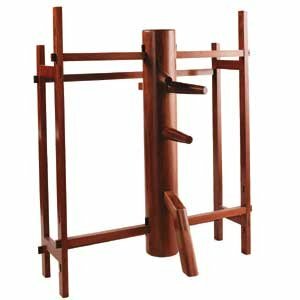 Has there ever been a more misunderstood martial arts training device than the Wing Chun wooden dummy? However, the rise of the internet has opened the door for great research and information on the subject. This is ironic since up until the 1960s, even people that studied Wing Chun for SEVERAL YEARS did not even know the dummy existed. Some Wing Chun schools would not even acknowledge the existence of the dummy until a student had trained for quite some time. These days, you can purchase a dummy online with a few simple clicks. However, many people have a false notion of what the dummy is for. Most will state that a Wing Chun dummy is designed exclusively to develop trapping (limb immobilizations). While trapping the arms (and legs and neck) is a part of Wing Chun, trapping is only part of the art. In fact, many Wing Chun schools put very little emphasis on trapping. So, what would be the use of training on a Wing Chun dummy? Would it benefit those in MMA? 1) It helps in the development and understanding of the distancing and angling the Wing Chun system is based on. 2) Developing the ability to move in triangulated patterns around an object or target is another component. 3) Toughen the arms through contact with the wooden arms and torso of the device is also achieved. 4) Pulling and pushing strength is another component. 5) Learning sticking techniques for both self-defense and Chi Sao applications is possible. 6) Manipulating around limbs as opposed to crashing through them is also developed. 7) Losing weight! Yes, you can burn a lot of calories working on the dummy. And honestly, there are scores of other uses for a wooden dummy. There are so many uses, in fact, it would be difficult to list them all. (Different types of wooden dummies are used in many other older kung fu styles), many different uses have been discovered for it. Those that are new to using a wooden dummy are advised to learn the traditional Wing Chun dummy form. This form will cover all the basics of the system and can provide a lot of food for thought when it comes to understanding the system as a whole. When you do learn the traditional form, please be aware that it is also okay to take bits and pieces of the form and train them separately. Also, do not try to turn learning the form into a memorization game. This is really little more than turning the form into a performance art demonstration that takes the value out of the process. Of course, the cost of a wooden dummy can be a little steep. These devices take A LOT of time to build and they are usually only sold to Wing Chun practitioners. As such, prices of a dummy may be steep. I have worked a deal with a company who will not only let you buy a dummy, but will ship for a great deal. This item will ship in 24-48 hours. It ships from Oklahoma. It will arrive from UPS. This Wing Chun dummy is made of hardwood, similar to traditional Muk Yang Jong.